The New York Civil Liberties Union (NYCLU), the New York affiliate of the ACLU, is one of the nation’s foremost defenders of civil liberties and civil rights. Founded in 1951, the NYCLU is a not-for-profit, nonpartisan organization with six chapters and nearly 50,000 members statewide. In 2007, the NYCLU created a group for Young Professionals (22-40) to support the work of the NYCLU by raising funds, spreading awareness, and building a community of like-minded New Yorkers and advocates for change. 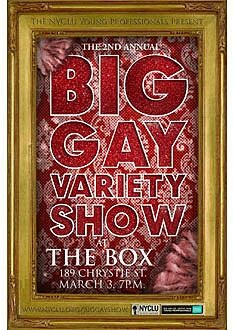 Proceeds will benefit the LGBT work of the NYCLU. The evening will feature an open bar all night, raffle prizes, a live auction, go-go dancers and many surprise guests.